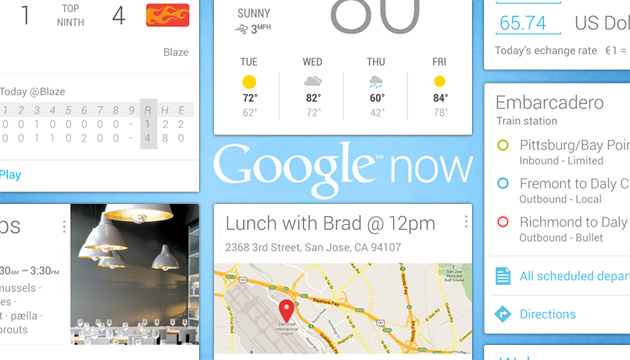 Whats up with Google Now? 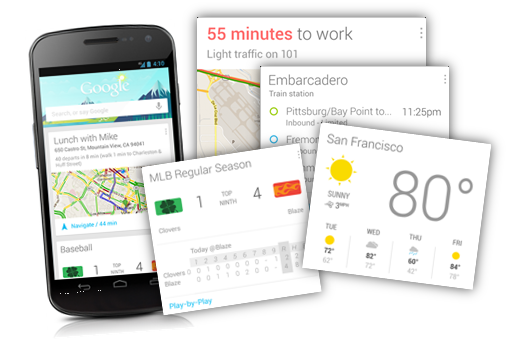 Google Now is an intelligent personal assistant developed by Google that is available within the Google Search mobile application for the Android and iOS operating systems. Google Now uses a natural language user interface to answer questions, make recommendations, and perform actions by delegating requests to a set of web services. Along with answering user-initiated queries, Google Now passively delivers information to the user that it predicts they will want, based on their search habit. Isnt it cool to find something in form of a card on your phone (one of the home screen), how much time will it take for you to reach HOME if you aren't at HOME or based on what you searched on map, automatically it will appear on your home screen card? Its like, knowing what to search before making an actual search. Google Now is implemented as an aspect of the Google Search application. It recognizes repeated actions that a user performs on the device (common locations, repeated calendar appointments, search queries, etc.) to display more relevant information to the user in the form of "cards". The system leverages Google's Knowledge Graph project, a system used to assemble more detailed search results by analyzing their meaning and connections. Google and Apple both think they've got the magic to meet all those requirements and more. The secret, it turns out, is to hand off the work to their artificially intelligent virtual assistants: Google Now and Siri. Though both technologies are relatively young, both of these companies are investing a lot in the idea that your dependency on virtual assistants will continue to grow relative to the amount of time you spend with your phones and tablets.